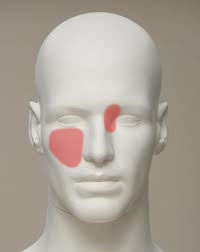 Do you suffer from a stabbing headache in the areas denoted in red? Do these headaches seemingly come out of nowhere one day? Perhaps started after a viral upper respiratory infection? This type of headache has often been confused with cluster headache, migraine without aura, sinusitis, or other undefinable pathology especially since CT scans and MRI scans that are obtained often do not reveal any tumor or presence of infection. Is Stabbing Headache Around Eye a type of primary stabbing headache?